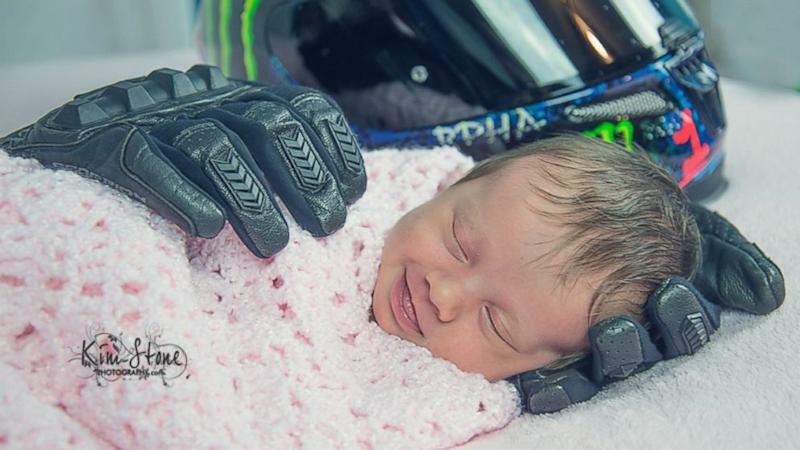 A newborn baby photographed with motorcycle gear has touched the heart of the internet because of the heartbreaking story behind it. Baby Aubrey's father, Hector, was killed just a month before his daughter was born, according to the family's GoFundMe page. Photographer Kim Stone of Marianna, Florida, was approached by her neighbor, Aubrey's grandmother, to take the newborn's photos. They talked about Hector's passions, one of which was biking. According to local media reports, Hector's body was discovered at an after-hours hangout for motorcycle enthusiasts. "I wrapped the baby in her swaddle, a blanket her great-grandmother had made," Stone told ABC News. "I laid her there and put the helmet next to her. Then as soon as I laid the glove under her head, she began to smile." "I hadn't even set up the lighting or anything else, but I grabbed my camera," she continued. "Kathryn [Williams, Aubrey's mom] was standing behind me, sobbing." The photo has been shared almost 75,000 times since it was posted on June 10. It has been liked more than 350,000 times. Williams wrote Stone a note, which she shared on her blog. “And I will screenshot the page in a few weeks and I'll print it off for her to show her the WORLD prayed and wept for her and mommy and daddy. That God moved the WORLD for us. That daddy made an impact even after he was gone and that would be his dream. Every prayer from another is one less weight for me to carry." "It's one more piece of peace I have and one less tear I shed,” the note added. Stone said, "I do this everyday. But here, something special happened."